There is no doubt that mega ripped ANYTHING is trending hard right now and One Teaspoon is definitely a brand that comes to mind for the perfect pieces. I will admit it took me time to adjust to the brand, I guess you can say I am particular with my rips. These shorts, the super popular One Teaspoon bandits, are meant to not look perfect. If you look closely one side has raw, fringed edges where the other side is rolled up and I couldn't get past it at first. Now I love them so much I really can't stop integrating them into my outfits on those hot sunny days. They are super short which is why I prefer to style them with longer lengths and/or more coverage up top to balance it out. This moto style vest caught my eye the second I stepped foot into Mendocino. I'm so into moto style leather jackets so this vest was a nice fresh twist for summer and obviously having options for how to wear it is a bonus. When the chiffon is attached it looks amazing styled with my pleather leggings but once that section is zipped off it becomes a vest you can really style with just about anything. Such a good score! 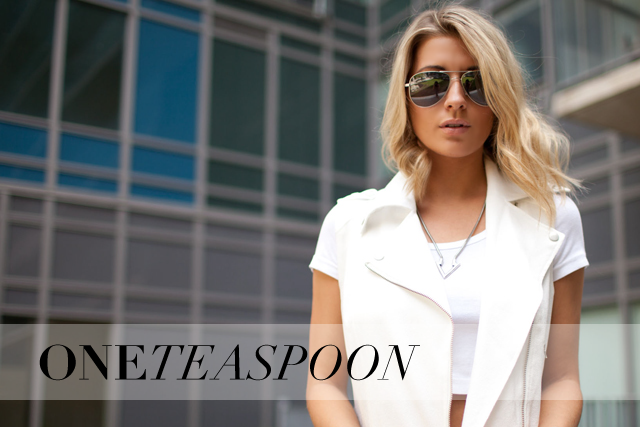 One Teaspoon is beyond amazing, love that brand.